Our Ocean and Beach Scents are our aromatic souvenir line of handmade soaps that celebrate the scents and botanicals of the North Carolina Outer Banks and other coastal locations, created for retail shop in Manteo, on the Outer Banks of North Carolina. We make scents like Ocean Rain and Beachcomber that recall leisurely walks on the beach, as well as soaps that help you cope with the results of especially sunny days, like Shea Butter Sunburn Soap, Bug-Me-No-More, and even Toasted Tootsies Foot Bar. No doubt you deep sea anglers will want at least one bar of The Fisherman's Wife Soap, for all those fish you're going to catch and bring home! 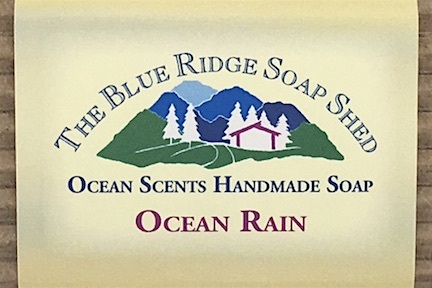 Our Ocean Rain handmade soap captures the coastal mist and the scent of the beach after a storm. Another tropical treat for beach goers, this Vanilla scent is enhanced with a little Coconut.